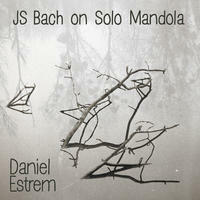 Daniel Estrem : JS Bach on Solo Mandola. All of the music on this album was written for the solo violin (Partitas) or solo cello (Cello Suite #2). Johannes Sebastian Bach's compositions take these instruments to their limit by providing an impressive display of what can be done on four strings, while reflecting a sense of polyphony and harmony. Within the mandolin family of instruments the mandolin is the counterpart to the violin and its strings are tuned to the same pitches. It should be noted that the mandolin family's metal strings are doubled (in unison) and generally played with a plectrum. The mandola, on the other hand, has the viola as its cousin and is tuned a fifth lower than the mandolin. Its body and neck are larger than the mandolin and it has a somewhat deeper sound as compared to the treble-sounding mandolin. The mandola, although now less common, is the ancestor of the mandolin, the name of which means simply "little mandola". This recording employs a somewhat non-traditional approach, as the mandola strings were strung singly which allows for a fingerstyle technique (no plectrum).